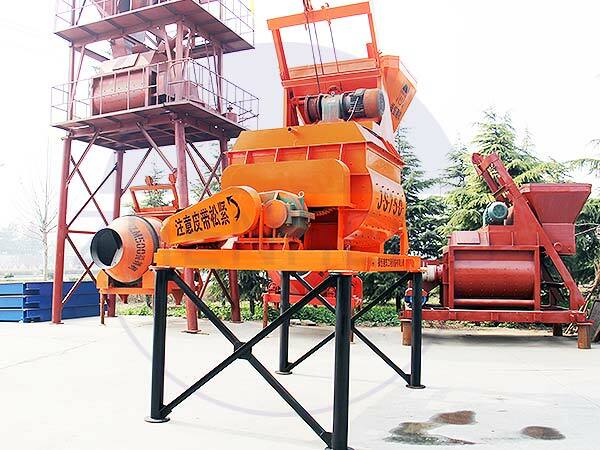 As the main components of the concrete mixing plant, the safety and long-term operation of the mixer is very important.But many people do not know how to maintain the concrete mixer, in order to make it longer life. This article will introduce JS concrete mixer which are common faults? How to exclude the failure? Link bolt loose, lining missing. Fastening link bolts, leveling linings. 3 thermal relay rated current is too small. 2 Remove the stones between the stirring blades and the liner, start the thermal relay reset. 1 stir the leaves touching serious, there is no timely replacement, resulting in the gap is too large, gravel jam, resulting in overload. 2 agitated shaft end support device resistance is too large. 1 Replace the leaves and adjust the gap. 2 stir the support device to add the lubricating oil. 3 motor brake separation clearance is too small. 2 Adjust the motor brake separation clearance. 1 hopper up the first limit switch is broken. 2 rocker loose, hit the needle rust. 1 Repair or replace the limit switch. Previous:How does the Compounding System and Other Accessories for the Concrete Mixer work?